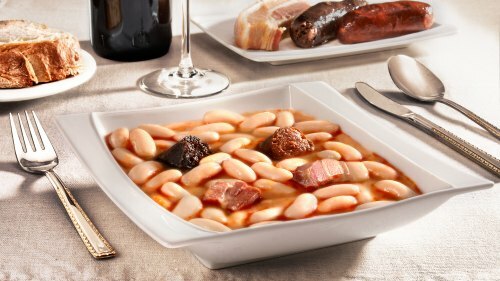 Fabada, the worlds' most famous bean pot comes from the wild mountains of Asturias. The beans are flavoured with all the local specialities like lacón, which is the cured front leg of a pig and oak-smoked fresh sausages. Salt pork or cured beef make good substitutes. Cured sausages also go in, and give an incredible richness to the flat, white, fava beans that constitute the base of the Fabada. Choose a stockpot that holds at least 10 pint (6 liter). Cover the beans, in a bowl, with plenty of boiling water. Put the salt meat (pork belly, brisket or silverside and gammon bone) into the pot and cover with cold water. Bring to the boil, then drain the meat and return to the stockpot. Drain the beans then add to the pot with the pepper-corns, paprika and saffron and bay leaf. Add 4 pints (2.3 liter) water. Bring slowly to the boil, then simmer very gently on minimum heat for 2 hours. A big pot on a small burner is best, and better still with a heat diffuser (such as the ones used to prepare paella). Check occasionally that the beans are still covered, but do not stir (or they will break up). Remove the ham bone and salt pork, to cool a little. Strip off the skin and fat, and take about 2 tablespoons of chopped fat for frying (instead, we recommend using olive oli). Sweat this in a frying pan. Fry the garlic lightly, then spoon it into the beans. Fry the sliced sausages and morcilla or black pudding (discarding artificial casings). Stir into the pot with the pan fat. Remove all the meat from the gammon bone. Chop it, and the salt pork or beef, and return to the casserole; simmer for a few minutes. Check the seasonings (there should be enough salt from the meat). This dish is distinctly spicy, so fresh green cabbage goes well.